Pressing unit for thermal compaction of Mg chips (Fig. 1, Ing. Rauch Fertigungstechnik GmbH). Cumbersome storage of the chips is no longer necessary. The pellets can be safely stored, transported and remolten with high material yields. A crusher inside the storage hopper breaks down the chips to an even size, ensuring optimum thermal compaction. 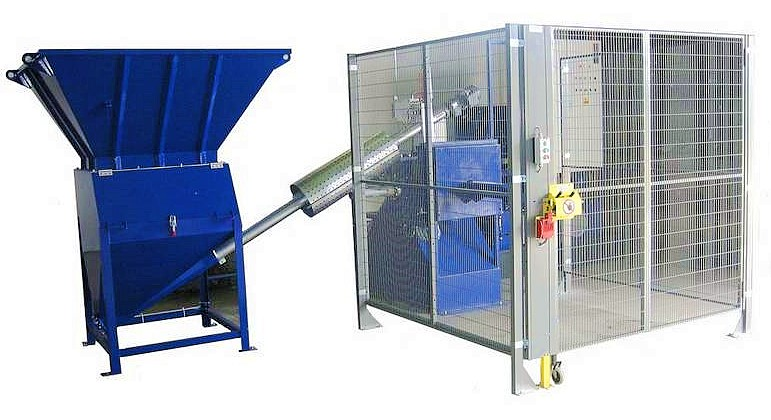 A screw conveyor then transports the chips to a rotary feeder used for even dosing. The chips are thermally compacted in a heated pressing chamber by means of a hydraulic piston and ejected.